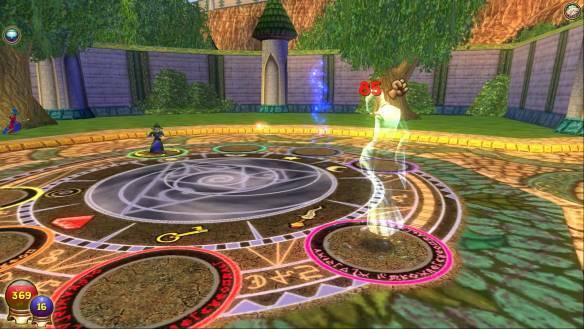 In Wizard 101 players get to take on the role of a young apprentice wizard joining the Ravenwood School of Magical Arts, a free to play story driven MMORPG that used a card collecting style combat where players must build up decks with different spells and use them in battle. The game offers quests, PVE combat and even PVP battles where players can challenge each other in the Arena for fun and prizes. The game is a young audience focused title with various measures put in place to protect younger players, ranging from pre-generated character names, restricted chat unless unlocked by an adult (where they cannot see or create typed chat but have access to pre-made messages) as well as heavy chat word filters to censor inappropriate language. There are seven primary schools of magic for players to choose, decided at character creation, these are Fire, Ice, Storm, Myth, Life, Death and Balance; each school has a different focus and various different spells for players to learn with each of them focusing on a particular combat playstyle. For example, the Fire school focuses on damage over time abilities with damage being inflicted each round of combat and spells become more powerful as they are stacked , Life magic teaches its students how to heal themselves and their companions in combat, ideal for solo play or when working with another player cooperatively and keeping them alive. The combat system is turn based, cycling through enemies and players one by one giving each of them the chance to draw a card from their deck and choosing their target to cast it on; with damaging and hindering spells being cast on opponents and healing and beneficial spells being cast on themselves. Each opponent in combat has a number of health points, the objective is to try and reduce an enemies’ health and knock them out of the battle; to do this they must draw cards with different cards costing a different amount of mana; run out of mana and the player can draw no more cards and is at the mercy of their opponent. Combat takes place in PVP and PVE, with PVE it is world PVE with players walking around and engaging in combat with the various enemies walking around specific to the zone and the quest they are on. When combat is initiated it begins in the open world and other players can see the battle happening, the spells/cards that have been cast, whose turn it is and how much damage each opponent is taken; other players can actually jump into the battle themselves and fight alongside another player and use their own spells to help them overcome the enemy. In PVP players battle against each other in the Arena, these matches can be 1 on 1, 2 on 2, 3 on 3 or 4 on 4 battles with players battling in cooperative competitive matches, they can play in unranked practice mode or in ranked mode to try and climb the leaderboard and earn prizes; at higher levels players can even fight each other in tournaments.